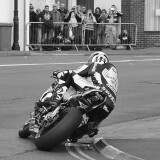 More TT photos, including black & white shots. There are a lot of very similar shots here and in the other 2015 TT galleries. I don't post these shots to show any skills I might have as a photographer, but instead to try to show at least one photo of every competitor, in what I think is the premier event in the purest form of racing in the world. The fact that some very reasonable people are demanding that it be banned just helps prove the importance of the TT as the ultimate test of a racer. Sorry to get so maudlin. 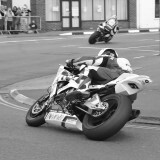 These were all shot from both sides of Parliament Square in Ramsey, on two different days, during practice and racing. They are intentionally not the usual angles for racing shots.